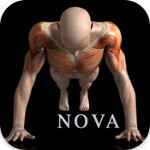 Fitness and bodybuilding apps are not very hard to find in the App Store. Not one or two developers have ventured into creating feature-rich solutions, some even going beyond what you'd normally expect, by including additional goodies like exercise animations, nutrition advices, schedules and so on. 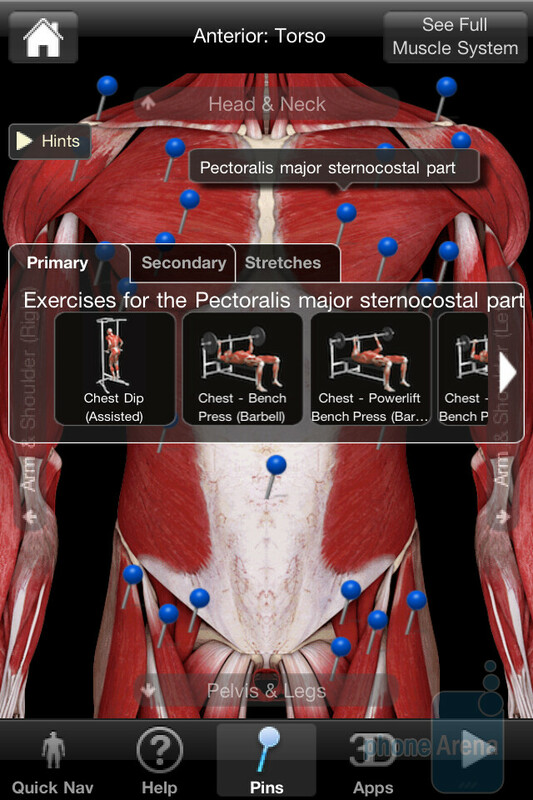 A recent prominent addition to the Healthcare & Fitness category is iMuscle. What the app manages to grab the attention with is its depth and appropriate visual execution. It's not without its imperfections, of course, so if you're planning on spending a few bucks on an app of this kind, it might be wise to read on and see if this one will fit the bill. 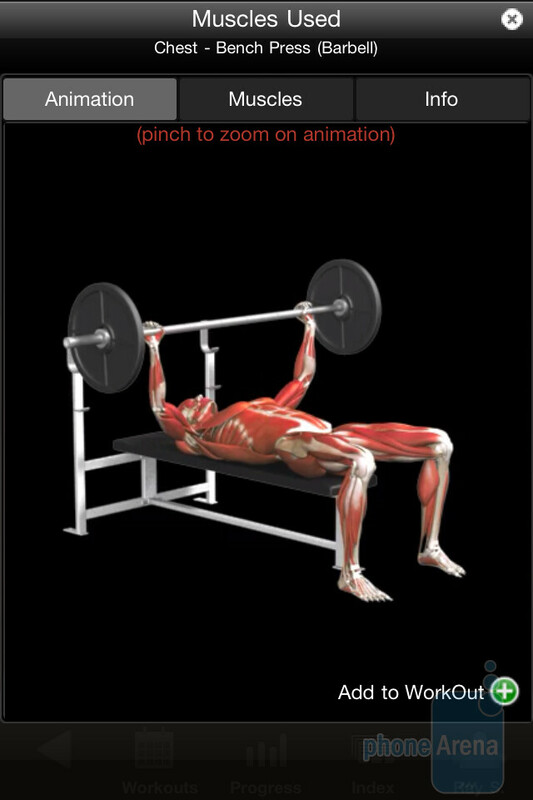 Instead of real photos and videos of people, iMuscle relies on 3D models and animation in order to visualize the exercises and show the correct way of doing them. 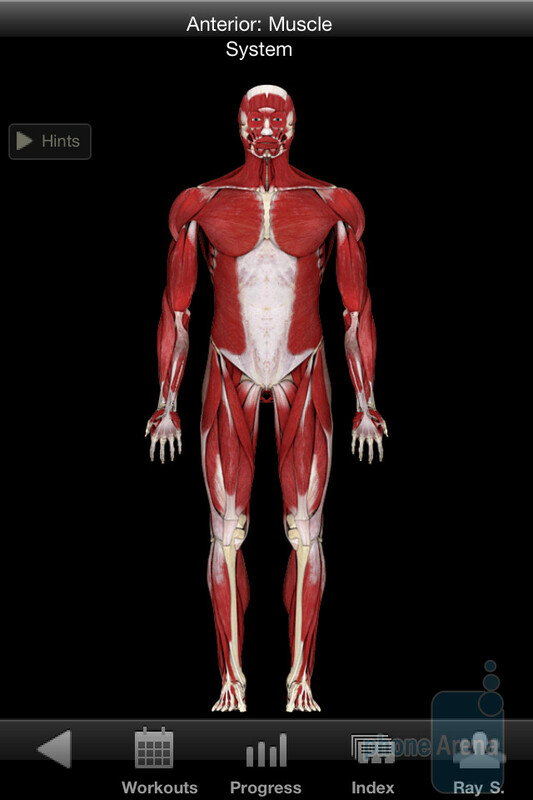 Most of the time, you'll be looking at a skinless virtual bodybuilder, which, to be honest, isn't in our list of most exciting things to do, but the concept “surprisingly” works for this app, giving you a clear view of how things should be done. The app's different functions are accessed through buttons at the bottom of the screen. There is a total of eight buttons, divided into two pages. Why on earth the Help and Apps (promotes the dev's other titles) buttons are on the first page, with functions that you'll surely use more often being left on the second is beyond us. It's apparent that navigation is not a strong aspect of the app. Rotating the 3D model, for example, in order to reach different muscles, feels clumsy and unpolished. 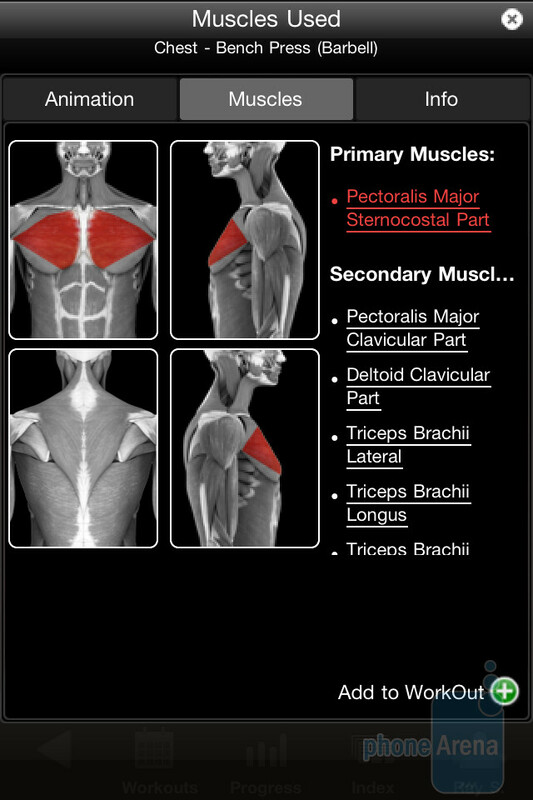 The same goes for zooming in and selecting the desired muscle group. In short, there's quite some room for improvement when it comes to navigation and easy of use with iMuscle. It is the exercise database and accompanying information however that makes this title pretty useful. Every single muscle you might be interested in is pinpointed, and, upon selecting it, the program presents you with long lists of exercises and stretches, making it easier for you to pick an appropriate activity. It's a great treat that every exercise is accompanied by an animation to show you how it's accomplished, plus, there's a detailed rundown of the muscles that are in use with it. iMuscle also allows you to create detailed workout programs, as well as track your strength and endurance progress, though, the process of workout creation could have been more straightforward. 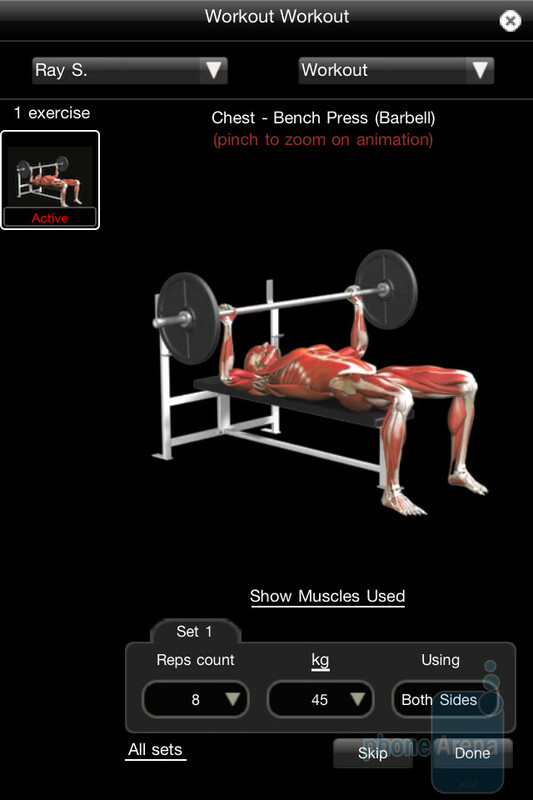 Is iMuscle for iPhone the ultimate all-in-one solution to facilitating fitness and bodybuilding? Well, not really. While it does have a very rich exercise database, with useful animations and accompanying info, it doesn't really deliver that seamless and fluid experience one would expect from a paid iPhone app these days, due to its sluggish performance, and clumsy navigation. It's by no means a bad app, it's just that it could be executed way better. Decent alternatives can be found with titles like the similarly priced All-in Fitness, or the free Fitness Pro.